I’m back. This golf blog lives. Yesterday I had such a rich learning experience on the golf course that it inspired me to get back to posting. On the heels of playing Cape Kidnappers in New Zealand, one of the most beautiful golf courses in the world (post coming soon), and a winter where my handicap index reached its lowest points ever (in the 15’s), I found myself yesterday with my first realistic chance to break 80. Playing from the white tees on Foxtail Golf Course‘s North Course in Rohnert Park, CA, I shot 43 on the front nine. Good for me, but nothing to blog about. But then, I opened the back nine, birdie-bogey-birdie and somehow continued (relatively effortlessly actually) by rolling off four pars in a row. I’m sure it was the first time that I was one under par for seven consecutive holes. I wish I hadn’t, but I couldn’t seem to avoid figuring out that if I could finish with one more par and a bogey, I’d shoot 36 on the back (my best nine ever) for a total of 79. And thus, I would break 80 for the first time. I had a real shot, a reasonable chance. And, then, as you might expect, it all unraveled. I finished with a double-bogey on 17 and a triple-bogey on 18 for an 83, a score that currently pleases me any day of the week. And, more importantly, I got one of the clearest lessons that I’ve ever had in keeping my focus on my inner process, NOT on the score… ever! The Ease of a Lay-up: This idea of remembering the smooth, easy, solid contact that I seem to make effortlessly on lay-up shots where there’s no pressure. This feeling has been working for me (I can tell, thanks to this blog) since 2007. “Slow & Throw”: During my travels in New Zealand, I met a friend of the inner game of golf who adapted learning from Fred Shoemaker‘s book, “Extraordinary Golf,” and came up with this sweet little mantra. She shared this idea of a slow take-away and a connection with the target through the very real physical feeling of throwing your club in that direction. It’s simple and it works, naturally. Just Make Solid Contact: This wonderful encouragement came directly from Fred Shoemaker via a phone consult back in 2009 just before I had to stop playing golf for 10 months due to back injury, but it has stuck. It’s good common sense, like my existential mantra, “Just hit the ball.” If you make solid contact not much can go wrong. Stay Behind the Ball: It’s another story, but at the driving range recently, I got a cosmic reminder from a fellow golfer who I did not know. This reminder of a years ago golf lesson has given me more power and consistency. I’ve been keeping my weight on my right side on take-away which helps me come through the ball with ease, again, naturally. These are the key elements of the inner game process and awareness that are working for me, one stroke at a time. Thinking about the score is a major distraction that can destroy any hole, at any time. I’m grateful to be making progress. And next time I have a chance to break 80, I’ll know better. I’ll bring my awareness back to what works. At least that’s what I intend to do. Please, golf gods, let this be a lesson, a learning for me. What do you do to keep your focus and your “ship steady” when “the chips are down” and you’re putting yourself under pressure for some reason (like winning a match with your buddy)? I’d love to hear your insights via a comment below. Coming soon: Pictures, video and sharing about my big fun experience at Cape Kidnappers, and a video of Fred Astaire accessing his sub-conscious mind while dancing and hitting golf balls. Some thought it was boring to see a little known pro win The Open Championship by seven strokes. I thought it was brilliant. First, he epitomized the one thing all golfers want… consistency. Second, he does what most of us know we should do, but which very few of us actually practice. He appeared to swing at 75%. Of course, he still hits the ball WAY far (#4 in driving distance, #1 in driving accuracy for the Open), but he was never out of balance. He was always swinging “within himself.” I found that balance–which must have also been related to the way he kept his emotional balance under all that pressure–to be nothing less than inspiring. In fact, I went out yesterday with his kind of balanced, 75% swing in mind as my intention or mental focus. It worked. An 86 from the blue/forward/members tees at Stonetree. Definite improvement. Progress, one swing at a time. Thanks, Louis! You deserve everything that’s coming your way. 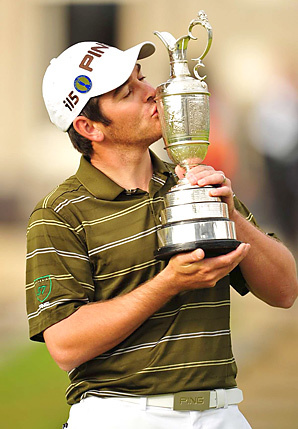 And, nice “icing on the cake” that you happened to win The Open on Nelson Mandela’s birthday. Perfect. Just my two cents. What did you think? P.S. I look forward to catching up with the blog posts in my head that haven’t appeared on this blog yet very soon. These include my trip to the US Open at Pebble Beach and playing with a fabulous golf simulator in Paris, France. Oh yeah, I seem to be making progress with my golf game as well. Awareness rules. More soon. I look forward to your comments, please. With many a turn and twist. To curse the shots you’ve missed. Sometimes the putts roll true. And troubles to play through. No matter what the lie. Give thanks that you can play.